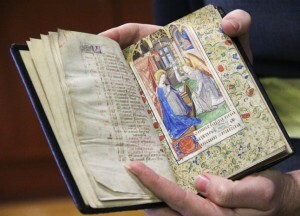 Sarah Seraphin, special collections librarian at La Salle University, gently displays an illustrated prayer book. One of the Philadelphia region’s greatest collections of historic biblical and religious material dating from the birth of printing and even earlier is housed in the Connelly Library at La Salle University. Among the treasures of the Susan Dunleavy Collection of Biblical Literature is the extremely rare Myles Coverdale Bible (1525), the first full Bible with Old and New Testament printed in the English Language. 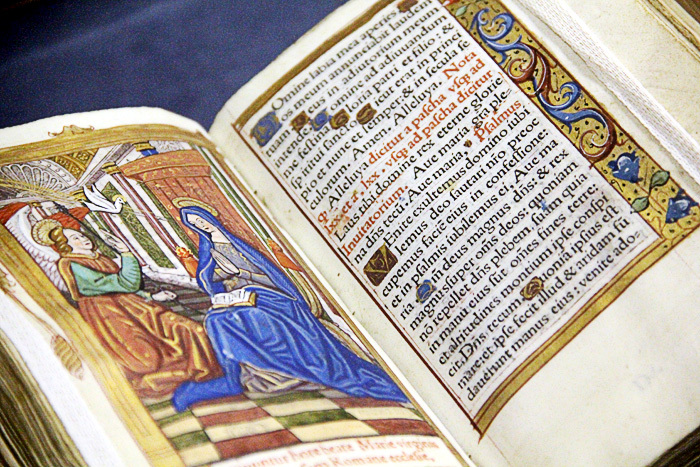 A selection of these holdings, including some that illustrate the Annunciation and Nativity, are currently on display in the library’s main reading room. 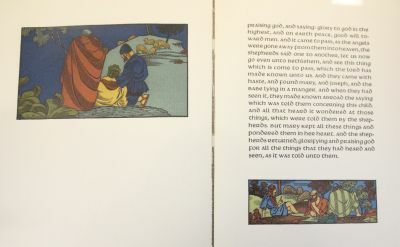 The Dunleavy Collection traces back to the 1970s when La Salle’s president, Christian Brother Daniel Burke, initiated a collection of illustrated bibles for the university’s just-forming museum. Funding for the collection was provided by Francis J. Dunleavy, president of International Telephone and Telegraph, and the collection was named in memory of his daughter, Susan, who had died in a tragic accident the previous year. The Dunleavy collection continues to grow through an endowment established by the benefactor and recent acquisitions include a 17th-century French devotional and a Latin breviary published in Rome in the 17thcentury. The collection does have special significance for the study of religion and religious art, but in a wider sense it is equally important for the study of history and the transmission of the written and printed word, especially in the English language, a specialty of the collection. For this reason it was ultimately transferred to the library. Nevertheless, the collection does include an element of art, for example the very fine engravings in old bibles. It is that artistic basis that is at the center of the current exhibit. While most of the collection traces back to the dawn of movable type, there are also older hand-inscribed manuscripts, for example an especially fine illuminated Book of Hours executed in Paris around 1475. 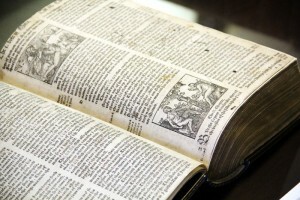 There is a printed Catholic Latin Vulgate from 1525, and rare English language first editions including the Geneva Bible from 1560, King James bibles from 1611 and 1613, and a first edition of the Catholic Douay-Reims. Most of the 202 early printed bibles are from Europe and the majority of those printed in English are Protestant because by then most English-speaking people were Protestant. 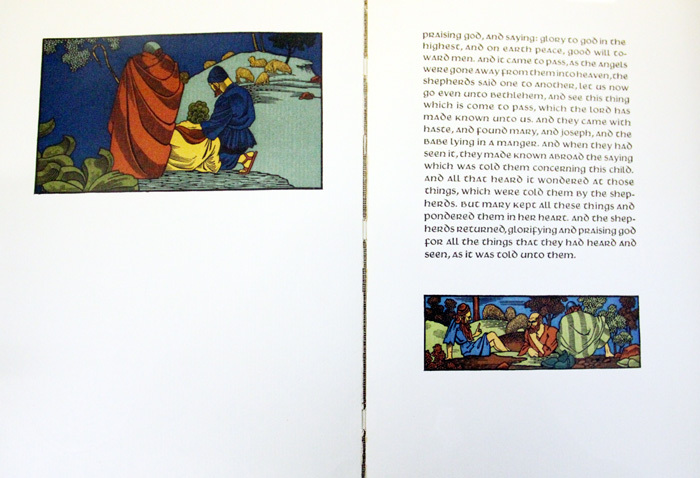 In addition to the complete bibles there are hundreds of other items in English, Latin and other languages. Many of the antique bibles are massive in size, because they were designed to permanently rest on the pulpit, and at times chained to it; not to keep people from reading them but because they were very valuable and difficult to replace. It is interesting to note that this very ecumenical collection is held by a Catholic university, considering Catholics and Protestants were not then especially Christian in their attitudes toward one another during the Reformation and Counter-Reformation era when so many of these bibles were printed. From a Protestant perspective this is underscored in John Foxe’s Book of Martyrs, a first edition (1563) that is held in the Dunleavy Collection. Consider poor John Wycliffe, a Protestant to whom is attributed the compilation of the first English-language Bible before the advent of the printing press. Although La Salle does not have an original Wycliffe manuscript version it does have a 1731 printed New Testament section of it. Wycliffe was already dead during the brief reign of Queen Mary (1553-58) when Catholicism was temporarily restored in England. He was posthumously tried for heresy with the penalty death by burning at the stake. Since he was already dead, Foxe recorded, his bones were dug up and burned. On the Catholic side, the Dunleavy Collection includes a Book of Psalms used by St. John Fisher who was martyred during the reign of King Henry XVIII. The current Dunleavy Exhibit at La Salle’s Connelly Library is part of an ongoing series titled “Devotion: An Iconography of the Life of Christ” and will run through Jan. 10, 2014. A second exhibit on the Last Supper through the Ascension will run Jan. 13-May 30, 2014. 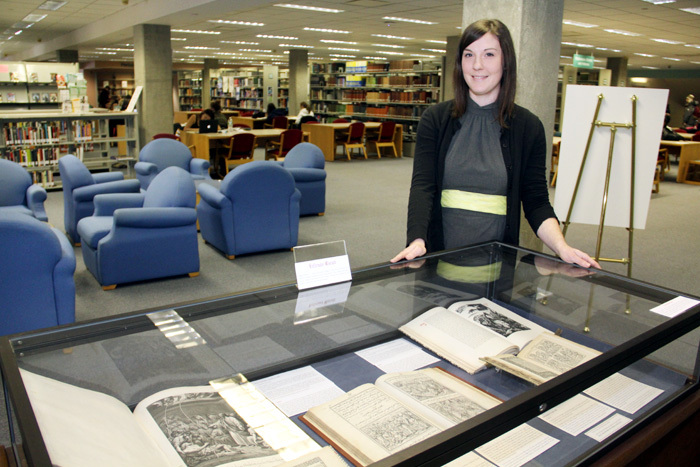 Sarah Seraphin, Special Collections librarian at La Salle University, stands by a case in the Susan Dunleavy Collection of Biblical Literature at La Salle’s Connolly Library.